Duck Baker, the fingerstyle guitarist from Richmond, Virginia, and Kieran Fahy, the Tuam, County Galway fiddler, met in Brussels in 1985. They have played together ever since whenever Duck’s travels brought him to Belgium. In 1998 they decided to tour together in America when Kieran could get time away from his duties in the excellent traditional group, Shantalla, and applied themselves to developing a repertoire that highlights the more strongly melodic aspect of Irish music, especially the slow airs and Carolan tunes. 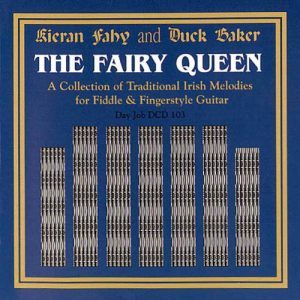 ‘The Fairy Queen’ is one of the more striking compositions by the great composer Carolan, but it is seldom heard, perhaps because of it’s unusually large range (two and a half octaves). The story has it that the bard slept a night near a fairy rath, and the Fairy Queen appeared to him in a dream, inspiring this melody. There are similarities between the B part of this tune and the A of ‘Sheebeg and Sheemor’, interesting as that piece was also inspired by doings of the ‘good people’. Duck and Dave Evans go back to 1976, when they toured together on one of Stefan Grossman’s Kicking Mule tours. It was a few years later that Dave applied his brilliantly original guitar style to Irish music, and probably just a matter of time before this exceptional composer came up with tunes in the idiom. ‘Ramble Over Stennis’ is a souvenir of a trip Dave made to the Orkneys a few years ago. Duck learned ‘Miss Forbes’ Farewell’ from Norman and Nancy Blake. Norman found this fine piece in O’Neill’s “Waifs and Strays of Gaelic Melody”. O’Neill notes the Scottish nature of this melody and the possibility that it came from Scotland originally. The unusual version of ‘Poll Halfpenny’ comes from a recording by the great Clare fiddler Bobby Casey, by way of Hal Hughes. Duck’s versions of the well-known jigs ‘The Joy of My Life’ and ‘The Banks of Lough Gowna’ were learned from an old Folkways record called “Irish Dance Music”. The setting of the latter, with its modulations from A to C, seems quite unusual. Whilc the majority of Carolan’s tunes were named for people he knew (mostly patrons), only one inspired four distinct melodies, and that was an unrequited love of his youth named Bridget Cruise. The tune heard here is the third of the four airs that bear her name. ‘Planxty Sweeny’ is a seldom performed bit of Carolania learned from Donal O’Sullivan’s definitive collection. Like many of his lesser- known works, it is a straightforward jig. ‘The Blarney Pilgrim’ and ‘The Market Girls’ are also jigs, the first well-known and the second obscure. Duck learned his version of the first from the Matthews Brothers, Larry and Terry. Hal Hughes was the source for the second, which would seem to be an American tune. Kieran and Duck were inspired independently to learn ‘The Wexford Carol’ from the same recording, by Michael O Suilleabhain. Christmas carols are rare in Ireland, apart from an area in the county that gives this beautiful tune it’s name. Owing to the fact that it appears in the ‘Oxford Book of Carols’, ‘The Wexford Carol’ will pop up in unexpected contexts, but few versions compare to O Suilleabhain’s for bringing out the unusual harmonies.